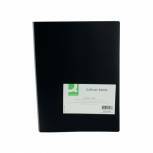 Q-Connect Polypropylene Display Book 20 Pocket Black KF01252 Pack of 1 Q-Connect polypropylene Display Books. Quality A4 display books ideal for everyday use and perfect for filing, display or presentations. Complete with 20 copy-safe pockets. Colour - Black. 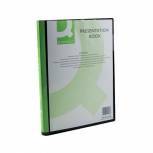 Q-Connect Presentation Display Book 20 Pocket A4 Black KF01265 Pack of 1 Q-Connect Presentation Display Book allowing full personalisation using the clear front pocket and full length spine area, perfect for filing, display or presentations. Complete with 20 clear pockets. Size: A4. Colour -Black. 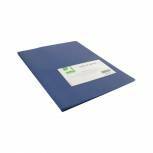 Q-Connect Polypropylene Display Book 20 Pocket Blue KF01251 Pack of 1 Q-Connect polypropylene Display Books. Quality A4 display books ideal for everyday use and perfect for filing, display or presentations. Complete with 20 copy-safe pockets. Colour - Blue. Q-Connect Presentation Display Book 40 Pocket A4 Black KF01267 Pack of 1 Q-Connect Presentation Display Book allowing full personalisation using the clear front pocket and full length spine area, perfect for filing, display or presentations. Complete with 40 clear pockets. Size: A4. Colour - Black. 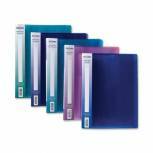 Snopake Electra Display Book 24 Pocket A4 Assorted (Pack of 10) 12219 Pack of 1 Snopake Display Books manufactured in brilliant Electra colours with a full length wrap-around spine for easy identification. A4 24 pocket. Assorted colours. Pack 10. 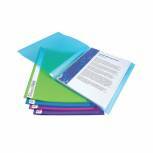 Snopake Superline Presentation Book 10 Pocket Polypropylene A4 Clear 11904 Pack of 1 Snopake Superline Display Books add style and flair to any presentation. Manufactured from 100% copy safe polypropylene and features transparent covers. A4 10 Pocket. 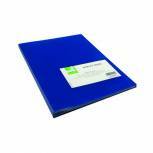 Q-Connect Polypropylene Display Book 40 Pocket Blue KF01259 Pack of 1 Q-Connect polypropylene Display Books. Quality A4 display books ideal for everyday use and perfect for filing, display or presentations. Complete with 40 copy-safe pockets. Colour - Blue. Q-Connect Polypropylene Display Book 40 Pocket Black KF01260 Pack of 1 Q-Connect polypropylene Display Books. Quality A4 display books ideal for everyday use and perfect for filing, display or presentations. Complete with 40 copy-safe pockets. Colour - Black. 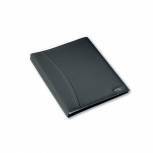 Q-Connect Presentation Display Book 10 Pocket A4 Black KF01263 Pack of 1 Q-Connect Presentation Display Book allowing full personalisation using the clear front pocket and full length spine area, perfect for filing, display or presentations. Complete with 10 clear pockets. Size: A4. Colour - Black. 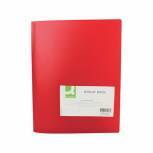 Q-Connect Polypropylene Display Book 10 Pocket Red KF01246 Pack of 1 Q-Connect polypropylene Display Books. Quality A4 display books ideal for everyday use and perfect for filing, display or presentations. Complete with 10 copy-safe pockets. Colour - Red. 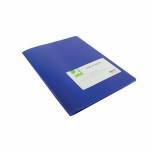 Q-Connect Polypropylene Display Book 10 Pocket Blue KF01247 Pack of 1 Q-Connect polypropylene Display Books. Quality A4 display books ideal for everyday use and perfect for filing, display or presentations. Complete with 10 copy-safe pockets. Colour - Blue. 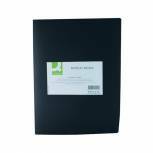 Q-Connect Presentation Display Book 100 Pocket A4 Black KF01271 Pack of 1 Q-Connect Presentation Display Book allowing full personalisation using the clear front pocket and full length spine area, perfect for filing, display or presentations. Complete with 100 clear pockets. Size: A4. Colour - Black. 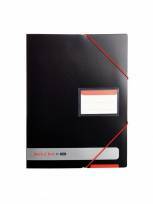 Elba Black n Red Display Book 20 Pocket A4 400050725 Pack of 1 Stylish and professional display book from the executive Black n Red range. Elasticated closure for security. Business card holder on front. 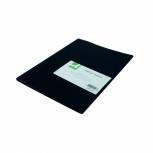 Rexel Nyrex Slimview Display Book 24 Pocket A4 Black 10015BK Pack of 1 Premium quality display book made from top quality Nyrex material ideal for creating the right impression in a one to one presentation. Handy card pocket on front cover. Hard wearing wipe clean covers. Lightweight, tough and compact. 24 pocket Black. 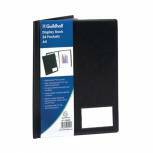 Q-Connect Polypropylene Display Book 10 Pocket Black KF01248 Pack of 1 Q-Connect polypropylene Display Books. Quality A4 display books ideal for everyday use and perfect for filing, display or presentations. Complete with 10 copy-safe pockets. Colour - Black. 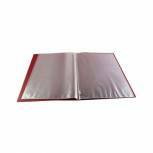 Q-Connect Polypropylene Display Book 40 Pocket Red KF01258 Pack of 1 Q-Connect polypropylene Display Books. Quality A4 display books ideal for everyday use and perfect for filing, display or presentations. Complete with 40 copy-safe pockets. Colour - Red. 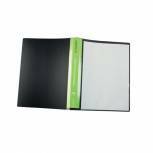 Q-Connect Presentation Display Book 60 Pocket A4 Black KF01269 Pack of 1 Q-Connect Presentation Display Book allowing full personalisation using the clear front pocket and full length spine area, perfect for filing, display or presentations. Complete with 60 clear pockets. Size: A4. Colour - Black. 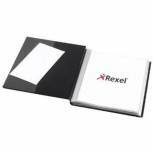 Rexel Soft Touch Smooth Display Book 36 Pocket A4 Black 2101189 Pack of 1 Premium quality professional display books ideal for corporate use. Smooth leather effect covers. Glass clear, copy safe pockets ensure your documents are protected. Business card holder for personalisation. 36 pockets. Black.